The Penguin and his gang receive a strange interactive television. On the other end of the line is Joker, who offers a plan to Penguin in exchange for the retrieval of a small object. The plan consists of robbing from major philanthropic citizens, and then using the stolen money to make charitable donations, which Penguin proceeds to do, elevating his status among the high society he so craves. Batman figures this out, of course, and just as the Penguin is about to accept an award for a large donation, Bruce Wayne makes a larger donation and receives the award instead. Penguin vows to get even by robbing Wayne. Batman is waiting for him, and easily takes down Penguins’ goons when they attempt to rob a Wayne property. Penguin is tricked into confessing on camera, and the crime spree is over. But Joker got what he wanted, and that’s all he cares about. This is the very first of the animated style comics, going all the way back to September 1992, and it’s a heck of a debut! The three-act structure follows closely to the format of an animated episode, and Puckett played well within the characters personalities. This would have made a fine episode. Templeton knows his stuff! He and Burchett must have immersed themselves in the show’s style guides, as the art plays very true to the show, even at this early date. Clean lines and on-model characters. Thanks for doing your homework, fellas! This story could have easily taken place during the early episodes of Batman: The Animated Series. I remember when this was first published! 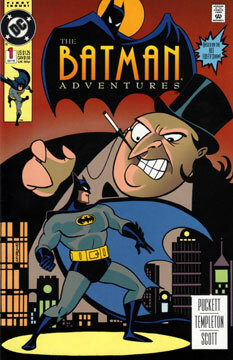 Believe it or not I was huge into the FOX Batman the Animated series when I was a kid! Well I was in high school but same difference. however I never found the same joy in the animated comics as i found in the actual cartoon. however great first issue!